Info "Do you wanna rock? I mean, really ROCK?! Wail on your electronic axe and take the concert to the next level!" 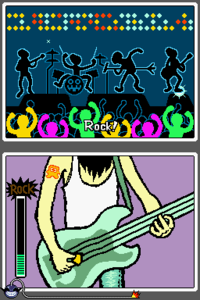 Power Chord is a microgame found in the Dance Club Rub stage in WarioWare: Touched! The objective of the game is to rock out the guitar by rubbing its strings back and forth until the meter is filled. 1st level difficulty: It takes a short time to fill the meter. 2nd level difficulty: It takes a slightly longer time to fill the meter. 3rd level difficulty: It takes even longer time to fill the meter. The rock star has a tattoo of Diskun, the mascot of the Family Computer Disk System, on their right arm. If the player chooses selects that they are left-handed, the rock star becomes a woman rather than a man. This page was last edited on February 26, 2019, at 07:34.